Andalusia is an autonomous community of Spain and recognized as a nationality in the preamble of its new autonomy statute. It is the most populous (8,370,975 inhabitants in 2010) and the second largest, in terms of land area, of the 17 autonomous communities of the Kingdom of Spain. Its capital and largest city is Seville.The region is divided into eight provinces: Huelva, Seville, Cádiz, Córdoba, Málaga, Jaén, Granada and Almería. Andalusia is in the south of the Iberian peninsula, immediately south of the autonomous communities of Extremadura and Castile-La Mancha; west of the autonomous community of Murcia and the Mediterranean Sea; east of Portugal and the Atlantic Ocean; and north of the Mediterranean Sea and the Strait of Gibraltar, which separates Spain from Morocco, and the Atlantic Ocean. The small British overseas territory of Gibraltar shares a three-quarter-mile land border with the Andalusian province of Cádiz at the eastern end of the Strait of Gibraltar. Andalusia has three major geographic subregions. In the north, the mountainous Sierra Morena separates Andalusia from the plains of Extremadura and Castile-La Mancha on Spain's Meseta Central. South of that, one can distinguish Upper Andalusia, generally the Baetic System, from Lower Andalusia with its Baetic Depression of the valley of the Guadalquivir. The name Andalusia traces back to the Arabic language Al-Andalus. As well as Muslim and Romani influences, the region's history and culture have been influenced by the earlier Iberians, Carthaginians, Greeks, Romans, Vandals, Visigoths, all of whom preceded the Muslims, as well as the Castilian and other Christian North Iberian nationalities who conquered and repopulated the area in the latter phases of the Reconquista. There was also a relatively large Sephardic Jewish presence. Since the Industrial Revolution, Andalusia has been an economically poor region in comparison with the rest of Spain and the European Union at large. However, the growth of the community especially in the sectors of industry and services was above average in Spain and higher than many communities in the eurozone. The region has, however, a rich culture and a strong cultural identity. Many cultural phenomena that are seen internationally as distinctively Spanish are largely or entirely Andalusian in origin. These include flamenco, bullfighting, and certain Moorish-influenced architectural styles. Huelva is a city in southwestern Spain, the capital of the province of Huelva in the autonomous region of Andalusia. 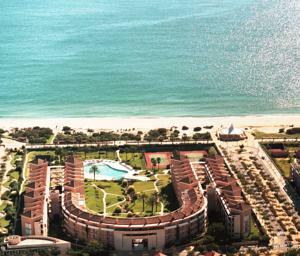 It is located along the Gulf of Cadiz coast, at the confluence of the Odiel and Tinto rivers. According to the 2005 census, the city has a population of 145,150 inhabitants. The town is home to Recreativo de Huelva, the oldest football club in Spain. Huelva is notable for being the site of landfall for Hurricane Vince, the only Tropical Cyclone ever to make landfall in Europe.